Replacement of house lighting in the main auditorium, the Patrick Centre, foyer and front of house bar and circulation areas. Custom illuminated Row End luminaires and all associated control systems. 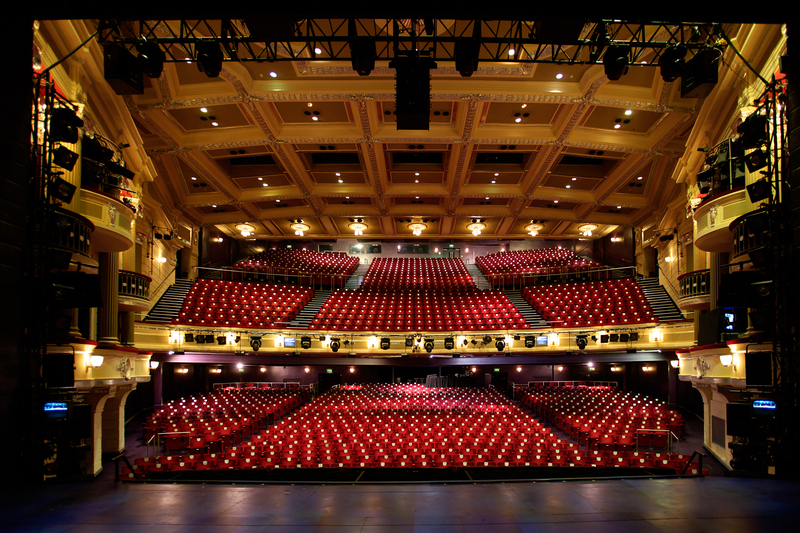 Push The Button worked closely with the Birmingham Hippodrome technical staff to design and install an energy effient lighting sol ution for their 1900 seat auditorium. The majority of the existing light fittings were replaced with GDS ArcSystem 4 Cell units providing sufficient light levels for both house lighting for performance and working light for fit-up and cleaning operations. In addition, GDS provided custom LED light engines to retrofit in the auditorium wall lights and high level pendants. Following the success of main house refurbishment and the subsequent energy savings, the Patrick Centre was similarly treated using GDS ArcSystem 1 Cell fittings and D1 drivers. A final project involved the replacement of all GU10 halogen lamps in the front of house areas with Push The Button designed replacement fittings using GDS ArcSystem Decor LED lamps. All systems are controlled by networked ETC Paradigm control systems with the front of house areas being controlled by overall light level detection to provide further energy savings.